When the Norfolk Millennium Male Voice Choir disbanded in 2009, several of its past members decided to continue singing together in a new all-male group, so they took it upon themselves to set up a new choir! Our founding Musical Director, Sarah Sheldrake - now Sarah Grimes - was recruited and the search for new Chorister Members, an Accompanist and for venues where the choir might rehearse, began. After the initial meeting, the rehearsal base (the function room at the Methodist Church in Mile Cross, north of Norwich City Centre), the name of the new choir (... the Phoenix which rose from the ashes of the previous choir ...), its uniform (an accessible all-black, no blazer, with a long green tie), and its ethos (welcoming to all men as choristers without audition) were decided upon, a first Management Committee was elected and being delighted that local musician Neil Ricketts had accepted the important role of Accompanist, the rehearsals then began in earnest. Since our Inaugural Concert in July 2010, Norwich's Phoenix Male Voice Choir has gone from strength to strength with a hard-working Musical Team and Committee, and the enthusiasm of its Chorister Membership. In the latter half of that inaugural season, we gave two packed house performances at our newly appointed home base, receiving fantastic comments and feedback from its new-found audience on both occasions. In 2011, the Choir doubled its number of performances and has produced a regular programme of Spring, Summer and Christmas Concert events in the years since then and, more increasingly, in between. We have also been pleased to share the concert stage with guest talented local musical groups and ensembles, other visiting and touring Male Voice Choirs and, in turn, to accept invitations from festival groups and churches to perform our songs, and to visit our new Male Voice Choir friends at their invitation. 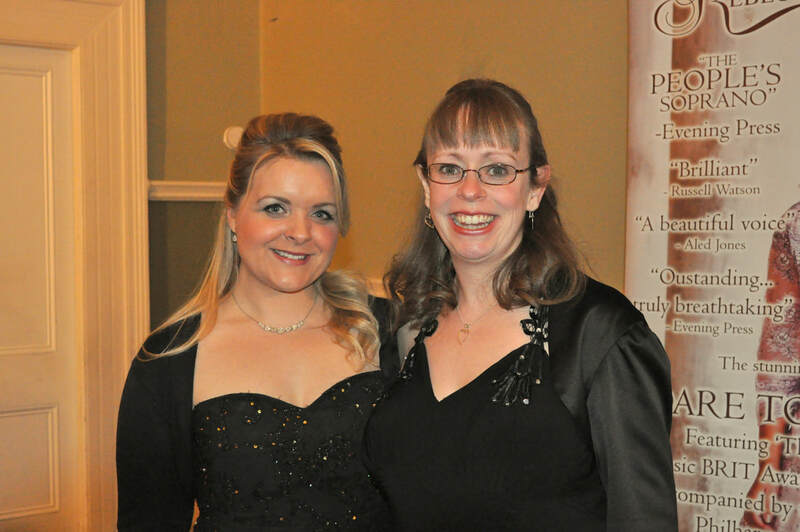 In 2012, we were pleased to accept an invitation from rising soprano Rebecca Newman to guest with her in Norwich during her 2012 RNLI 'Coast to Coast' UK Tour. Rebecca is now better known as 'The People's Soprano', and supported well-known tenor Russell Watson on his 2015 UK Tour, among other eye-catching engagements for her. 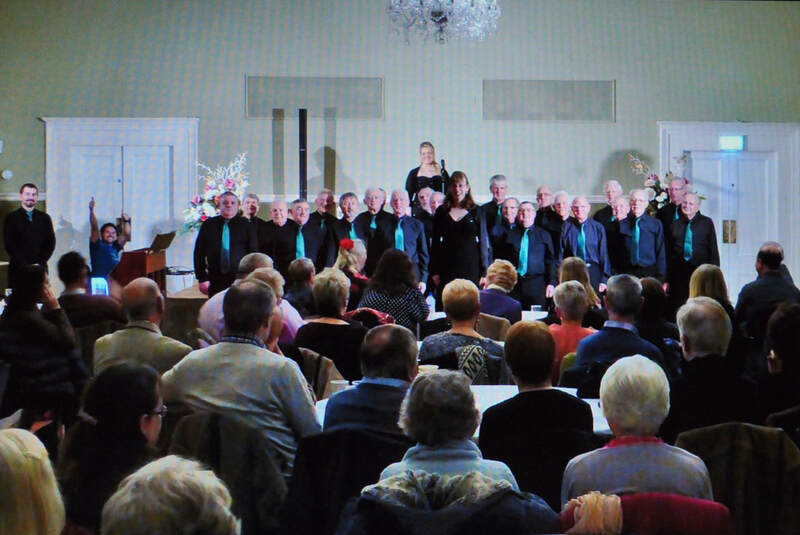 We were also equally delighted to appear during a return visit by Rebecca in February 2016 at the prestigious Norwich Assembly House on her mini-tour 'Romantica - the Love Songs', where the Choir, as her special guests, joined in the mood with five love songs of its own. During the last nine years, whilst Sarah has remained firmly at our musical helm with unwaivering approval, we wished a fond farewell as accompanist to the extraordinary Neil Ricketts in 2013 as he took up a new musical role, we warmly welcomed (and just as fondly later bade farewell to) Simon Ireson as he brought his cheerful personality and considerable musical talents to continue our success (but delighted that Simon was able to support us for a while behind - and on occasions in front of - the scenes! ), and we now have just as warmly welcomed Jason Lambert to our midst as our accompanist. If his exceptional debut piano solo at our Christmas Concert 2016 is anything to go by, our audiences are in for continuing musical treats! With the obvious dedication of our talented Musical Team and the enthusiasm of its Choristers, Norwich's Phoenix Male Voice Choir continues building on its experiences and delivering a varied and interesting repertoire of male voice song in its concerts. In a more relaxed moment (well, more relaxed for those not involved, anyway!!! ), our Quiz Team "Yes, Sarah!" challenged the Eggheads and proudly gave an excellent account of themselves then, and on every occasion that episode is repeated! A firm highlight of Spring 2017 was being able to host a joint concert with the well-established Radcliffe-on-Trent Male Voice Choir on their tour to Norwich and we are looking forward to the opportunity to link up with them again as their guests in May 2019. For 2018, we were pleased to share the stage in Sheringham's St Peter's Church as guests of the New Sheringham Singers in March, a first for us in that our hosts were an all-ladies choir! That gave the evening's audience the chance to listen to not only our excellent host's SSAA Choir selections as well as those of our TTBB voices, but effectively a combined SATB Choir to close the show in style! An extraordinary highlight the following month was our participation as one of the 'Four Choirs in Concert' with colleague songster members of the National Association of Choirs in East Anglia at Norwich's iconic Anglican Cathedral, compered by Phoenix's M.C. and local broadcaster, Ian Masters. The concert was the Saturday evening event of the NAC's 2018 National Conference held this time in Norwich. Not only were NAC guests treated to a programme of our four individual choir performances, and an evening fully BSL-signed by the very passionate Dr Paul Whittaker including a piece written by well-known composer Bob Chilcott and signed by conference delegates, but our massed Choirs of more than 100 voices closed the show under the direction of our own Sarah Grimes. We also 'dared' to leave Norfolk for the first time when we brought our "Summer Evenings of Song" to Beccles, and our singing year ended on a massive high note with "We'll Be Home For Christmas", our best-ever attended Advent concert event. Norwich's Phoenix Male Voice Choir is excited about its biggest-ever singing programme in 2019 as it embarks on a schedule of 5 of its own concert productions in Spring, Autumn and Christmas, along with 3 guest invitations. We are looking forward to visiting our MVC Friends at Radcliffe-on-Trent (so, our first real tour visit! ), as well as welcoming new MVC Friends from Millhouse Green to Thorpe St Andrew, east of Norwich, in September for "A Night of Fire and Steel". We are also taking the opportunity to present our 2019 festive event "Heralding Christmas!" not only at our Mile Cross base as usual (and on the 'usual' Saturday! ), but additionally at Stalham near the Norfolk Broads on the Saturday prior to Christmas. We are very grateful as usual to all of our supporters and helpers, and to everyone who follows our social media for our latest news and events, and we send our hugest thank you to our 2018 audiences for your concert support and for making these evenings so memorable for us - we hope to have made them memorable for you too! As we look forward to our 10th Anniversary in 2020, we look forward to seeing you and singing for you during 2019!